Today it's snowing and right now it looks like it could go for an inch an hour. So here's a project to go with the day. 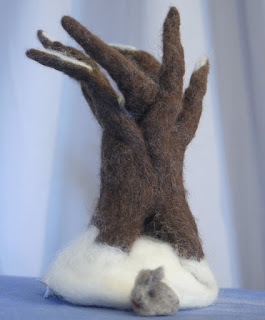 Once when I was setting up a felting class, one of the students asked if we could do a tree like this for the project. She had seen it online. So we tried it, and this is how mine came out. 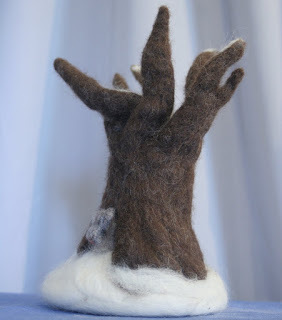 When he saw it, the boy said the tree had to have a “house-hole” at the bottom and he felted the bunny to live in it. Speaking of the boy, he recently turned 13, so it's time for his quilt. When the girls turned 13, each of them got a flannel quilt to wrap up in and comfort them through their teen years. The quilts were made of flannel from dad's old shirts, my old nightgowns, and scraps from many sewing projects - so they were warm and full of memories. This morning I ironed out the fabrics for the boy's quilt. It was fun to sift through the memories as I worked, and will continue to be so as we design his comfort-wrap.